Christophersen was stationed around Auschwitz throughout 1944. In his original work Auschwitz: A Personal Account, however, Christophersen clearly states several things which are blatantly false, or which show just how unreliable his testimony is. So I went in the direction of Bielitz and there found a mining camp in which some inmates also worked. I travelled around the entire camp and examined all fire grates and all smoke stacks, but found nothing. I asked my colleagues; the answer...a shrug of the shoulder and "don't pay any attention to these rumors." Actually, there was a crematorium in Auschwitz, I was told, for there were 20,000 people there and any city of that size has a crematorium. Of course people died here as they did elsewhere, but not only inmaes at the camp. The wife of one of our supervisors had also died here. As far as I was concerned, tha was enough of an answer. From the quote, it is clear that Christophersen was not personally familiar with Krema I (main camp), but rather had to rely on the statements of others. Also, as Christophersen limits his answer to a single crematorium, it is obvious that he was unaware of the four Birkenau crematoria. As these were theforemost sites of the gas chambers in Birkenau (and he doesn't even know they existed), just how credible are his conclusions that there were no gas chambers? Christophersen obviously did not go far enough in his search. Olga loved to constantly chatter and her continual gossiping, rumouring and wondering as to wheher or not corpses were being burned (whilst I knew for sure there was no such happening) finally got on my nerves. This, plus her almost slavish servitude, brought us to a parting of the ways. She was given a new job, one I did not begrudge her. While Christophersen states to have "knew for sure" that corpses were not being burned, the available aerial photography betrays his falsehood. Indeed, we just discussed such photographs on this forum a month ago. Revisionist heavyweight Carlo Mattogno also has stood by open-air cremations in 1944, as well as the fact that the Birkenau crematoria do (occasionally) smoke. After the war I saw a TV film about Auschwitz that showed a building with huge smoke stacks. I am very sorry, but when I left the camp at Auschwitz in December 1944, I did not see this building. I cannot imagine that these smoke stacks were built in the cold winter of 1944/45, but I suspect that these structures were erected after the war. It also seems implausible that, if they should have existed, the SS did not destroy them. As no images of the "smoke stacks" are presented, it is hard to say which building(s) Christophersen is referring to. Anyway, it is well recognized by modern "revisionists" that the Nazi camp had five crematoria, none of which were forged or built into existence. This quote illusrates Christophersen's willingness to easily discard that which does not agree with his own (limited) view of the camp, despite a preponderance of evidence. During the past few days I have heard a report on the radio according to which 4 million people are supposed to have been shot at Auschwitz. It is an absolute certainty that no people were shot at Auschwitz, because this we would have heard. That this fact is disproven by camp records (especially those which state 'auf der Flucht erschossen') and is hardly questioned by most revisionists is noteworthy. 3) the influence that post-war information had on his own 'memory' and perception of the camp. Either way you take it, Christophersen's account can NOT be used as a reliable indicator regarding the exterminations (or lack thereof), for he was NOT in a position to know. Implying that Christopherson is the best Revisionists can do is a strawman, he is not. The fact that the absurd 'gas chambers' are impossible as alleged makes everything else besides the point. Curious that Wahrheit thinks his interpretation of Christopherson is legit, while ignoring the absolutely laughable claims of so called 'eyewitnesses' and '$urvivor$'. We've debunked them all, notice the avoidance of that fact. Nice post Wahrheit. I don't recall anyone taking a denier eyewitness to task in this fashion and find it interesting. Is it true Mattogno never uses him as a source? Carto's Cutlass Supreme wrote: Is it true Mattogno never uses him as a source? I also did not find any reference to Christophersen in Mattogno's work on the crematoria ovens, nor on the open-air cremations, likely because Mattogno flatly contradicts Christophersen. Wahrheit wrote: In his original work Auschwitz: A Personal Account, however, Christophersen clearly states several things which are blatantly false, or which show just how unreliable his testimony is. Wahrheit, I have been Google your title "Auschwitz: A Personal Account" and not able to find it. Can you provide us a link? Malle wrote: Wahrheit, I have been Google your title "Auschwitz: A Personal Account" and not able to find it. Can you provide us a link? I'm afraid the book is not available online. One can order it (Amazon has it, though it's certainly not worth $50). I acquired it from a library. Christophersen's testimony at the second Zuendel trial (as reported, not transcripts) can be found in Kulaszka's account of the trial, but that is about as much as your going to get. In the earlier linked to thread, Heydrich also l gave an audio file of an interview he had. What "falsehood?" You are the liar, Wahrheit, once again. There is absolutely nothing about that smoke that shows that it is from corpses being burned. Nothing! CCS ahould get his head checked also. Once again, you Wahrheit have absolutely no idea as to what you talking about or even looking at. You are obviously grasping at every conceivable straw to try to make any insane kind of anti-Nazi argument. BTW, in this picture as in ALL of the aerial recon photos there is not the slightest whisper of smoke from any of the Krema chimneys. Fritz Berg: calling Wahrheit a liar and saying I should get my head checked is out of line and against forum rules. Similarly your whole sane/insane/sanity test is an ad hominem attack also. So what? Didn't Wahrheit call Thies Christophersen a Liar? So don't be a cry-baby. Life is tough! Nazi Gassings Never Happened Niemand wurde vergast! Friedrich Paul Berg wrote: What "falsehood?" You are the liar, Wahrheit, once again. There is absolutely nothing about that smoke that shows that it is from corpses being burned. Nothing! CCS ahould get his head checked also. Once again, you Wahrheit have absolutely no idea as to what you talking about or even looking at. You are obviously grasping at every conceivable straw to try to make any insane kind of anti-Nazi argument. Well, Mattogno agrees that corpses were cremated outdoors, which he acknowledges did emit smoke, based on the aerial photographs, in addition to other evidence. Images of these cremations were captured by Allied aerial photography. His disagreement arises from his estimate on the possible number of cremated corpses. Also, I never called Christophersen a "liar," which you try to use to justify your atacks against me. I believe Christophersen could have been speaking accurately with his observations, but I think it's very clear that he drew false conclusions from his observations; conclusions for which he would not be in a position to know. As such, his testimony is unreliable. Never have I used the words "liar" or "lie" to describe him. So to say that the crematoria never smoked is shown to be wrong by the aerial photographic evidence. – smoking chimneys at the crematoria. 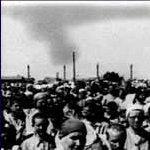 – a single smoke plume rising from the chimney of crematorium III visible only on the photograph of August 20, 1944.
and sporadic cremation of registered detainees in the yard of crematorium V.
This does not contradict anything Thies Christopherson said in the interview I posted earlier. Conclusion: Christopherson is a million times more reliable than you. While Christophersen states to have "knew for sure" that corpses were not being burned, the available aerial photography betrays his falsehood. I think "his falsehood" here in this context is the same as a lie. Once again for any sane readers, the aerial photos do not show that any corpses were being burned in the open. It is Wahrheit who is lying when he insists they do. Some outdoor burning of corpses may have occurred from time to time, especially in 1942 before Kremas 2 thru 5 were built, which should be no surprise--but that is NOT proven by any aerial photos, nearly all of which were taken in 1944 long after the Kremas were available. No, as I stated, "His disagreement arises from his estimate on the possible number of cremated corpses." Nothing you state (which deviates off-topic and does not come back to the original post, against forum rules) contradicts my succient description of his opinion. He believes corpses were cremated outdoors, but that the numbers involved don't match up to what has been alleged. With the degree of memory's fallability, it does not surprise me that things he recalled changed after time; however, I believe that the most independent statements that Christophersen made, reflecting closely to what he actually observed, are more likely to be found in his 1974 book, rather than an interview in 1992. As with other witnesses, Christophersen was prone to outside influences, which therefore changed his own testimony about the camps. Had everyone also agreed that no corpses were cremated outdoors, it is highly doubtful that he would have "remembered" this aspect, which he had emphatically denied earlier. Of course, that "revisionists" often use such changes in a witness' testimony to discredit the entire statement goes without saying. I find it interesting that you are sticking to the single, latest testimony of Christophersen, as opposed to his earlier statements. Indeed, you haven't even offered any defense for his prior statements, which clearly contradict his later one. Last edited by Wahrheit on Sun Jan 24, 2010 11:31 am, edited 1 time in total. No, it is not (nor was it my intention). It was an untrue/false statement, which is a definiton of falsehood. If I wanted to call Christophersen a liar, I would have done so, and not couched it in terms of his false statements. I'm sure many revisionists would not take well to you calling Mattogno a liar regarding open cremations in 1944. To say that the aerial photographs are the only evidence is also incorrect. I do suggest checking out Mattogno's book (I imagine you wouldn't bother for non-revisionists). Thies Christophersen never claimed to have known everything about Auschwitz--but it is reasonable to believe that if there had been any mass gassings, he would have certainly known about them. He was bold enough and forthright enough to say that he never heard about anything of the sort. Judge Wilhem Staeglich also said that.